I've been a physiotherapist in Vietnam, volunteering in four different hospitals, a school for disabled kids, and out in the community in Da Nang, Hoi An, and rural Quang Nam since 2005. And while my first years here were certainly educational for me and afforded me the opportunity to personally help countless disabled Vietnamese people, I--like every other foreign therapist I have spoken with--was unable to make any significant impact upon the way in which Vietnamese-trained physiotherapists practice physical therapy. 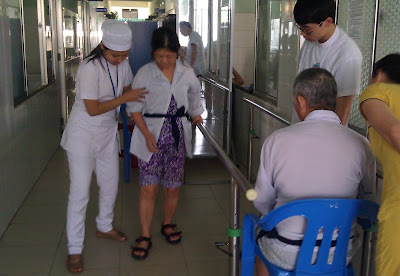 As you can see from earlier blog posts, I had in fact given up on trying to change practice here and instead, since 2010, been focused solely on providing hands-on rehab for patients at the Traditional Medicine Hospital of Da Nang, a 140 bed non-acute facility that had an abundance of stroke patients, but not much to offer in terms of physiotherapy. However, when Dr. Nguyen Van Anh became director of the facility a year ago, everything changed. Not only did he immediately begin renovating the sadly deteriorated hospital and grounds, he also initiated several new projects, including a widely acclaimed drug rehab program. And--of particular interest to me--he brought in a large number of newly graduated Vietnamese therapists on a probationary basis and told them that if they wanted to work in this hospital, they would be required to follow and learn from me. This has made all the difference in the world! Although neuro-rehabilitation is an especially challenging aspect of physical therapy and although their earlier training had left them without the ability to evaluate, plan and implement effective treatment regimes for individual stroke patients, our young therapists have been doing their very best under my guidance. I would not say that they are "world class" therapists at this point, but they are head and shoulders above any other therapists that I've encountered in the ten years I've been volunteering in Vietnam. And they continue to improve with each new patient that they treat. I am so very proud of them! Remarkably, word of mouth has already brought us an ever increasing number of patients from the city of Da Nang itself and also from Hoi An, Quang Nam, Quang Ngai, and Hue, as well as from the mountainous region to the west and the off-shore islands of Cham and Ly Son. In fact, in the days immediately following the Tet holiday this year, 45 stroke patients were admitted to our service while other nearby rehab facilities received but a few. Our patients now include not only those who had been frustrated by ineffective rehab treatment they had received elsewhere, but also new stroke patients, transfered to us directly following their initial acute stay at the General Hospital of Da Nang. Dr. Anh has a new vision, and I'd like to help him achieve that as well. We would like to create an effective Early Intervention program for children with cerebral palsy and developmental delays. Existing child rehab programs in Da Nang attempt to deal piecemeal--with very minimal success--with older children who have already developed contractures and/or maladaptive movement patterns. We want to catch kids early and work together with the child's family to guide them on a developmental path which holds the best potential for their optimal development. Thanks to our open-minded therapists and to our supportive administration, we have a wonderful opportunity to do something great for the disabled children of Da Nang and their families. Now all we need is an experienced foreign paediatric physiotherapist to guide us in our efforts. If you know of anyone who might be interested in such a long-term volunteer opportunity, please send them our way!